Wood, floral or oriental and does it matter? Does it matter if you can classify what fragrance you’re wearing? If you know whether it is a floral, fougère or oriental? In theory, if you ask someone like me who is against superficial pointless namedropping – the answer is no. There is absolutely no point in keeping that sort of stuff in your head just for the sake of it or because you “should” know. In practice however, there are two reasons for you to think about perfume classification – the main one being that it’s a great tool for new discoveries as it will provide you with concrete links between what you like or dislike, and this will lead you to new fragrance pleasures. And pleasure is a great reason to care about things. The other reason is just simply curiosity. Some people just like maps. I do. 19th century perfumer Charles Piesse was one of the first to start classifying perfumes. He quickly turned to the world of music for symbols and so the language of perfumers became similar to that of musicians (which it still is today). The terms used in perfume language have the purpose to describe the different aroma layers in a fragrance, like chords. We also talk about top notes and different tones when distinguishing between ingredients and specific scents. We talk about the tonality of a fragrance just like we when analyzing a music piece. There is also a more architectonical way of visualizing perfumes. 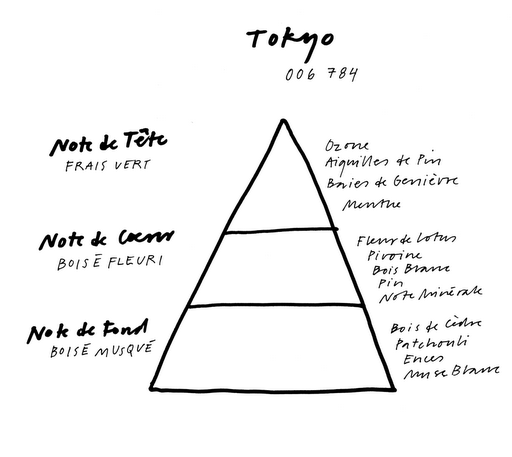 William Poucher was one of the first to use the ‘fragrance pyramid’ to explain the top, middle and foundation as layers. He created the structure based on measurement of evaporation rate of perfume ingredients (fastest evaporation = top). Here are some terms (from different eras, let’s not be so dogmatic) that are good to know when going on your perfume quest. The terms continuously develop and some perfumes contain traits of different families. Floral: There are a few different types of floral fragrances. A Single Floral is a fragrance dominated by one particular flower (if you are fragrance shopping in France just channel Vanessa Paradis or madame Deneuve and say “soliflore”). Floral Bouquet is combination of fragrance of several flowers in the perfume. And Bright Floral is a modern fusion between Single Floral & Floral Bouquet. Amber or Oriental: Fragrances with slightly animalic scents of ambergris or labdanum, combined with vanilla, tonka bean, flowers and woods. Orientals are not fragrances from the Orient but rather evoke the European (or specifically Victorian) 19th century image of the Orient. Wood: Fragrances dominated by woody scents, usually sandalwood and cedarwood. Leather: Fragrances with a middle note with honey, tobacco, wood and wood tars. Chypre: Bergamot, oakmoss, patchouli, and labdanum. “Green” is a modern more light version of this group. Aquatic/Oceanic: A modern category with clean often androgynous fragrances. Citrus: Used to be a term used about eau de colognes now used for, well, citrus fragrances. (I know, a bit boring this description but some things are just not that complicated). Fruity: Fragrances characterized by other fruits than citrus for example peach or passion fruit. Gourmand: A term used for fragrances that often contain tonka bean, vanilla etc and create associations to desserts or flavors. If these terms seem confusing or too many, The Fragrance Wheel might be your tool. It was developed in 1983 by Michael Edwards and based on four standard families: Floral, Oriental, Woody and Fresh. (Edwards divides these into three sub-groups which helps us see connections. The subgroups are Floral, Soft Floral, Floral Oriental, Oriental, Soft Oriental, Woody Oriental, Mossy Woods, Dry Woods, Citrus, Green and Water. But I think you might be ok just remembering the four main ones). Fougére gets a special position in the center as it combines elements of all four. If you know just these five terms you are safe, and it is likely that by studying the wheel and fragrances that you like you will be able to tell your preferred scent family/families. Also, if you ask someone in a perfume store for help and they give you a puzzled look – then I would suggest go to another store. Let’s encourage enlightenment, shall we? I have found several “how to find your fragrance” articles that talk about how a certain type of person or age is recommended to go for one of the fragrance groups (eg fruity – young girl, fougére – man, green – sporty, oriental – in the evening). This is not my kind of fragrance approach. Be aware of the signals that your fragrance sends out, what it communicates about you. But find your thing. Go for what makes you feel good – and feel like you.